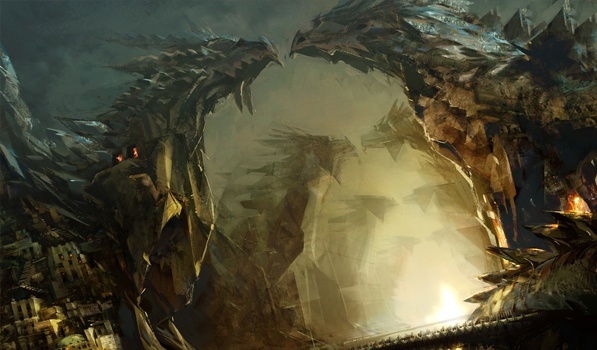 Tap: What is your involvement with the Guild Wars 2 marketing campaign? What message and audience are you trying to reach? Daniel: My involvement with the marketing campaign consists primarily of PR appearances, attending trade shows, and trying to take every opportunity that’s available to get in front of our fans and promote the game, pointing out the quality of the art, our intentions and vision. Beyond that, I work closely with our marketing department to ensure our visual branding is consistent and unified and that we don’t make the mistake of just putting it all together from isolated bits and pieces. Tap: Of the many games studies programs at university level, a surprising number of students want to be concept artists – far more than there is room for in the industry. What does a well-rounded artist need to know to thrive in the business? Daniel: I couldn’t agree more with that assessment of the supply far exceeding the demand. I always feel bad when I have to discourage people to pursue concept art as a career, simply because statistically the odds are stacked against them. I think most think that it’s the easy route. ‘Doodling’ is thought to be easier than learning 3D program, but it’s completely false. 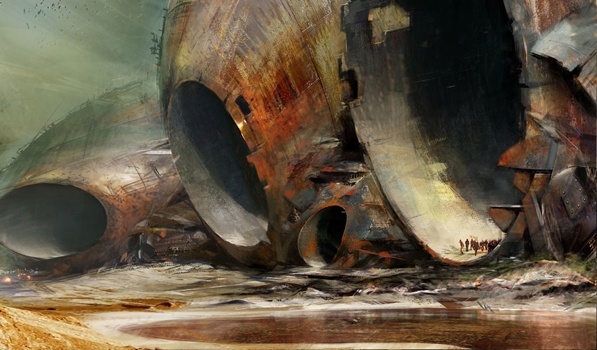 The ‘doodling’ that many students seem to consider qualifies as concept art is under-par. Concept art is primarily about communicating ideas, not letting your brush or pencil lead and the brain follow. I always encourage students to ‘get a foot in the door’ via the 3D modeling, texturing, or animation route. The odds are better for every position. The ones who really have what it takes to become concept artists will eventually get there one way or another, but the odds for getting your first job are higher if you pursue the production route. Anything but concept art. Tap: You’ve said in the past that “good-caliber talent is hard to find,” and that “It’s really hard to get through the hordes of people who have no business being near a pencil.” Do you think this stems from such university courses encouraging participation in a field individuals really aren’t cut out for, or more the allure of the games industry? Daniel: I think everything I’ve ever said will come back to haunt me! I’ll elaborate though. Firstly, as I said, I do think there is a supply that far exceeds the demand. It is borderline irresponsible on the part of art schools to pump out as many so-called artists as they do. The fact that many art schools are primarily businesses is seriously affecting the balance on the market. To assume all these students will end up working in the field of their choice is really quite far fetched. Tap: What are the main skills that are lacking in students or young artists you encounter? Daniel: I want to make it clear that talent is overrated. Talent is a short-hand term we use to encompass a wide range of qualities someone has to possess to be successful in a field. It’s not just some god-given gift you either have or don’t — if you have it, it will take you places whether you work on it or not and if you don’t you’re doomed — I don’t see things that way. I think determination, discipline and really hard work are all components of success. You also have to be wired in a certain way. I’m not a psychologist and therefore not eloquent at defining those qualities, but there seems to be people who have more ease in functioning on that different plain; connections happening in a different way, whether by instinct, intuition, or something else. There is a little bit of that, but the main indispensable attributes are the ability to focus, tenacity and drive. It doesn’t happen often for all these qualities to be concentrated in one individual, let alone in thousands upon thousands of individuals. Some people may have the artistic inclination and the creativity but lack the drive or ability of hard work and sustained intensity over four years of school. At the end of four years education, there is only a fraction of students who present themselves as a complete package with a convincing body of work (both quality and quantity wise) who would indeed stand a good chance in the very competitive job market. Everyone else may struggle a great deal, and it’s heart breaking for me as a parent to see all these kids misled into believing it’ll be a walk in the park. Tap: Excluding MMOGs, what sort of games do you enjoy playing? Do you find yourself analyzing the visuals? Daniel: You’ll be disappointed to hear, but I don’t play games much. I watch others play a whole lot though. The reason is because as soon as I pick up a controller or keyboard and get involved into a game, I find myself losing any trace of objectivity and any ability to be analytical and critical about it. By watching people, looking over people’s shoulders, I can maintain that level of detachment that allows me to learn from those games. Tap: Did you have any input into the visual design of Guild Wars 2’s races (or the redesign, specifically the sylvari?) and what is your favourite Race/Class in GW2? Daniel: As far as designing races, we have artists on the Characters and Creatures Team who are really passionate about character design. I felt the wisest thing to do would be to take advantage of their passion and let them do what they do best. My contribution was limited to overseeing the design of the races and giving occasional pointers, but I don’t take credit for generating the vision for the races. Just observing and suggesting occasional course corrections and channeling their creative energy is how I choose to interact with that team. I really don’t have a favorite race though; they are all equally close to me. 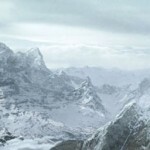 I think primarily in terms of habitats—the environments as defined architecturally and technologically by these races. They all have interesting aspects that intrigue me a great deal. Right now I’m more and more thinking of the next races to be introduced in future expansion packs and that’s what I’m all excited about. But I’m not revealing any secrets yet! Tap: Was there any specific reason why ArenaNet chose to revisit some races? Was it to try to make them stand out or from an unhappiness at the finished product? Daniel: Guild Wars 2 has been in development for a few years, and our tools and technology have evolved and our vision is constantly developing and changing. For some races the early design didn’t stand the test of time. You build and implement things, some grow on you and some tend to age poorly and beg for redesign. The sylvari were one of those cases where one of the artists on the team — she really came up with a new vision of what they should be and how to go about it and was itching to give them a re-work. That’s the sort of creative drive that would be a shame to deny. We said go for it! Tap: Is everyone at ArenaNet now happy with the final design? Daniel: We’re happy! Some aspects may still change between now and ship, although our time is running out and we’ll need to wrap it up sooner or later, but we always reserve the right to improve on certain aspects as time and budget allows. To iterate and make it better. Tap: Finally, have you anything else exciting planned for today? Daniel: Haha! I’m hoping to get some hands-on work done before meetings start at 10:00 am; from there on I lose control over my destiny! And with that last word, Daniel left us in search of coffee. Although Daniel and ArenaNet’s PR team weren’t quite ready to provide us with more than a glimpse of the sylvari, we have since received an invitation to return to the subject in a few months. We hope to bring you some exciting details of the redesign very soon. Everyone at Tap-Repeatedly is grateful to Daniel Dociu for taking the time out (at a very early hour!) to chat with us and provide such a wonderful insight into his creative genius. Thanks also to everyone at ArenaNet who made this possible, and allowed the interview to come together so quickly. Best of luck with Guild Wars 2 – we’re watching excitedly, and so are many others. Email the author of this post at lewisb@tap-repeatedly.com. Otherwise, decent read, but not as good as the part 1 and 2. You must appreciate Chew that Daniel has his hands tied in how much he can or can’t say in relation to the redesign. Daniel has revealed more of the redesign than most, and for that I am very greatful. Speaking to Daniel after the interview, he did seek for us a glimpse of the redesigned Sylvari, but the PR department simply weren’t ready, yet. Interesting read, shame about not getting any real info out of sylvaris tho. The new races for future expansions didn’t really surprise me, the original Guild Wars already had a couple of well-established races like the tengu or the centaurs (for factions and nightfall respectively) which they could use. Yay!. I would have loved more on the Sylvari, though, 🙁 Some concept art would have been great! Great end to the interview. Perhaps we’ll be able to secure some info about the Sylvari in the near future. No promises, you know how publisher PR is, but it’s possible. Nice job, Lewis. Thanks for all your hard work. Mr Dociu, ArenaNet, thanks again and good luck! Thanks! Good to hear about races being added in expansions. I think they will keep the sylvari to themselves for now, until they do the Sylvari race week. Good work Lewis. I know a lot of fanboys and girls will be disappointed that you teased the hell out the sylvari news and delivered only a “stay tuned” promo; but, it is ridiculously hard to keep that lot happy. I’m sure when the juicy stuff gets unleashed, sans-embargo, you’ll regale us with something worthy. The really meat of this part of the interview is the discussion of the state of arts education and the fate of many aspiring artists. We creatives tend to be a little less pragmatic and more somnambulant than the general population. This tends to mean that we get exploited a lot in business because no-one wants to tell Johnny Artboard that he’s not good enough or that they can’t find a way to make money off what he loves doing so much. We’re sensitive and everybody knows it. Once again, Daniel Dociu shows up with enough bravery to admit the reality of the situation. Having great talent is never enough on its own. Success requires hard work, perseverance, networking and the luck of being recognized when you’re ready to perform. Talent gives you a slight edge only if you have everything else working for you. There aren’t enough good teachers out there telling young artists that need to be the whole package. There also aren’t a lot of people on the planet who are able to be honest about their abilities when they are young. Age makes it easier; but, the lessons learned while aging can be hard. I think your absolutely right, and it has been overshadowed somewhat by the Sylvari. It’s really tragic of the industry; you only have to look on various industry websites to see the sheer volume of talent, but is that talent really excellent? Good, yes. Universities or colleges don’t care, the prospect of £7000+ a year tuition fees is too an exciting prospect to turn down. They are a business after all. Advice from Daniel on how to break into the industry, I see as priceless for aspiring artists. I think this part was as good as well the first and second one. An interview with a well recognized artist, who are involved in lots of things, gives us more chance to hear some sneak peak about the industry, and that’s always a good read, in first place for those who would like to involved in it as well. I’m not disappointed because not having any specific information about the sylvari, revealing any new races can set, and also should deserve a whole new article on its own. Ty Lewis B for the interesting article. Yeah sure it is, but what about your final sentence: “we have since received an open invitation to return to the subject in a couple of months”? Lewis, fantastic interview overall. Well thought-out, informed questions, and it was obvious that you have a great respect for Daniel, and he reciprocated appreciatively with his earnest answers. Well done – I look forward to reading any further interviews you might do. Why not have options for the sylvaris to form out either planty like or elvish like. That will make everyone happy. Other than that, everything sounds stable for now. Thank you very much for this interview. It was incredibly interesting and informative and it was great seeing things from such an incredible artists’ point of view.